Jay H. Utley was born March 31, 1879, the son of John and Mary (Huddlestun) Utley. After 4 years of high school he became a teacher in East Porter School while living at home with his parents. 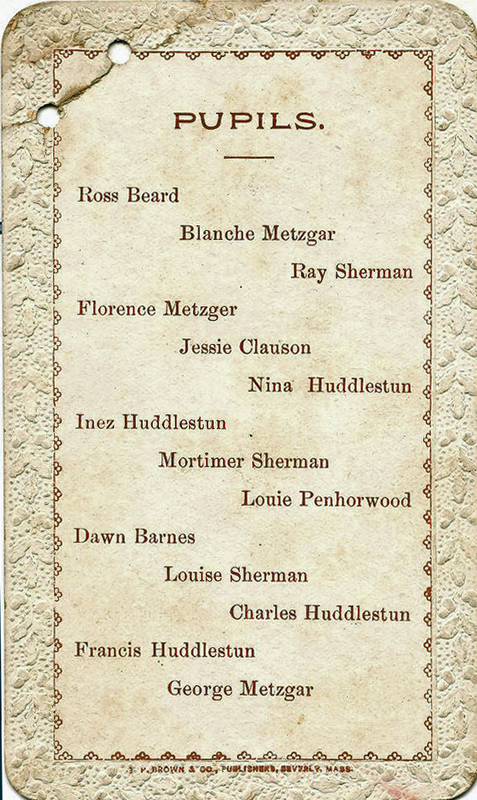 By 1910 he was married to Lena Belle and they were the parents of George Russell who was born in 1905. By 1910 the family moved to Columbus where Jay worked as a clerk for a factory. In the 1930 census, Jay and Lena lived in Delaware where Jay was a janitor for the college. By 1940 they had joined their son George R. and his family in Willow, Glenn Co., California where Jay died in 1948 and Lena Belle in 1964. Milton Hunt served as Clerk of the School Board. He was born in New York in 1839 . in 1870 census he and wife Emma (Moody) lived in Monroe, Knox County with sons William (born 1864) and Alfred (born 1868). Milton was a farmer. In the 1880 census they lived in Porter Township and had two more children, Alberta (1872) and Lee (born July 25, 1879). Milton continued to farm. By 1900 Alfred had taken over the farm and Milton and Emma lived with him. Lee and his wife Mable farmed next door. 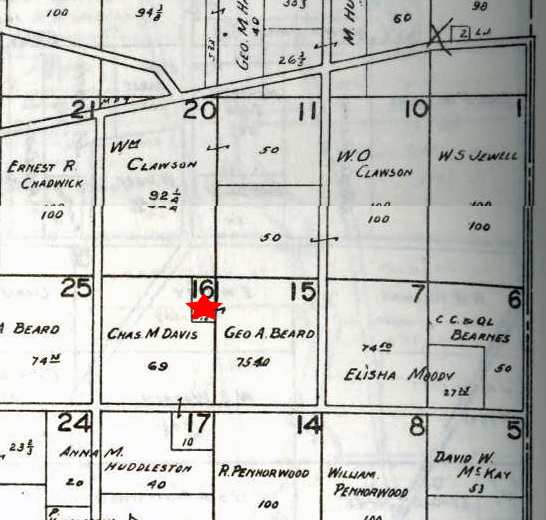 Milton lived in Centerburg when he died in August 25th, 1926. Wm. Clauson was a farmer and the father of Jessie Samuel Clausen. He was born in June 1851son of Samuel (born 1826 in New Jersey) and Ruth (Davey born 1835 in Maryland). In the 1870 census Samuel's family lived in Porter Township with an Ashley post office and four children. In 1882, William married Alice Owen born May 1864 and they had Lamoil born May 1882, Jesse Samuel born June 1889. In 1900 they lived in Porter Township next door to William's brother Winfield and wife Cora and nephew Royal Gilmore Clawson. William died June 7, 1924 in Delaware County. The last name of the family is usually spelled Clawson. Rebecca Penhorwood was the widowed grandmother of Louie Penhorwood. She was born in March 1830 in Ohio, married William Colwell Penhorwood (born 1824 in England) in 1852, lived in Knox County in the 1860 census. She was the mother of Mary Grace (who married Joseph Wayne Bronson) born March 1853, Francis E. born 1855, George W. W. born 1856 and William A. born 1859. 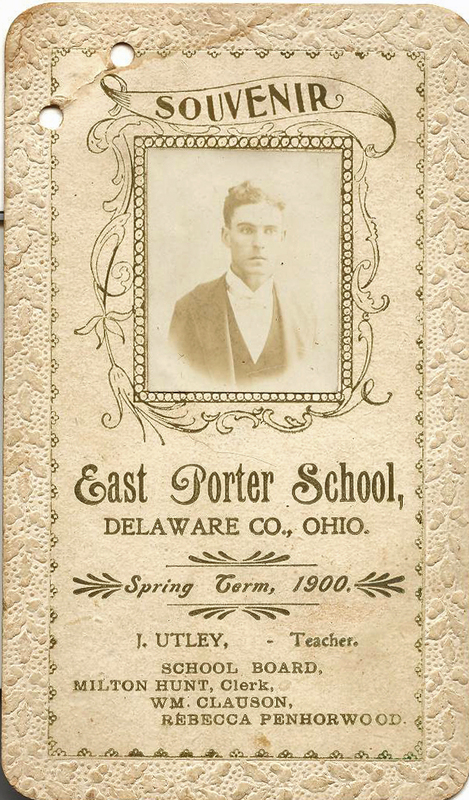 In 1870 they moved to a farm in Porter Township and added Elmer B. (Corn 2--14-1863), Charles born 1866 and a 4 month old baby. William died in December 1907. Rebecca died in February 1912. Both are buried in Centerburg. 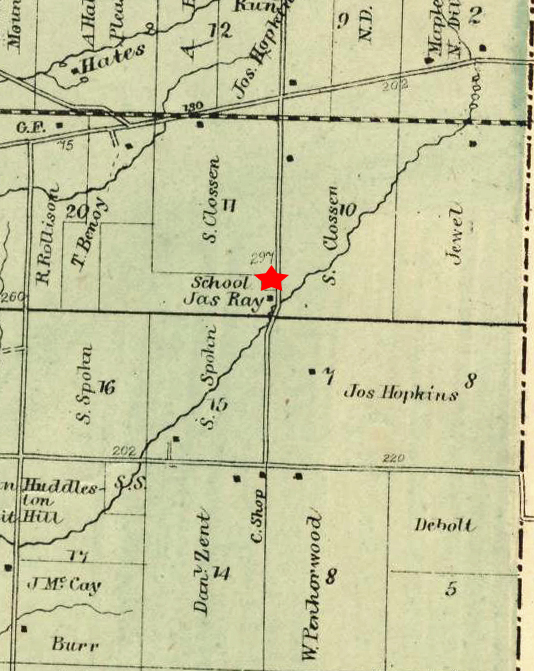 There are many schools marked on the 1866 Porter Map, but this one has the right families living near it.